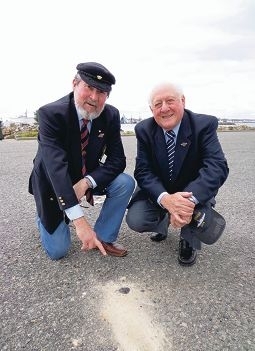 Australian Sailor Monument project member Commodore Bob Trotter and convenor Gavin Ryan examine a test spot on the North Mole. The monument aims to recognise the role sailors played in not only discovering and developing WA, but also in defending it during times of war. The grant of $418,450 has allowed preliminary work on the project to start and engineering testing has already been carried out. Project convenor Gavin Ryan said the monument, a sculpture, would feature a bronze sailor leaving home to join a ship. A solar clock with a 13.5-metre high gnomon (the part of the sundial which casts the shadow) in the shape of a ship will be visible from below the horizon at sea. ‘There is nothing like this monument in Australia as a tribute to our sailors,’ he said. The project is expected to cost $1.9 million.